Posted June 28, 2011 by roland valckenborg & filed under News, Tanzania. In fact…I wish my internship and stay in Tanzania were only halfway through, but there’s only a good month left of my 3-months internship. Up till now I’ve been busy mainly with analyzing wind and solar data for specific sites in Tanzania. Since most of our wind measurements in Tanzania are the first of its kind, it has led to many interesting graphs and results. For processing the wind measurements I make extensive use of the Matlab application WindAaPPP, developed by the previous intern Arthur Vos. 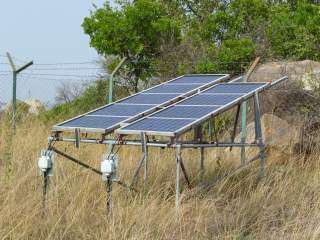 The solar data is obtained through the software called Homer Energy, which is a very powerful tool to find optimal small-scale hybrid system configurations, taking into account a wide range of factors such as wind and solar resources, component costs, daily electricity consumption profile etc. optimal hybrid configurations are highly site-specific. Reliable wind and solar data as well as a precise knowledge of the decomposition of costs and the daily electricity profile is needed. in low wind regimes (annual average wind speeds of around or under 3m/s) the cheapest option for small electricity consumers like households in rural areas is not a hybrid but just PV panels.